Bath time doesn’t have to be a mundane, challenging task. 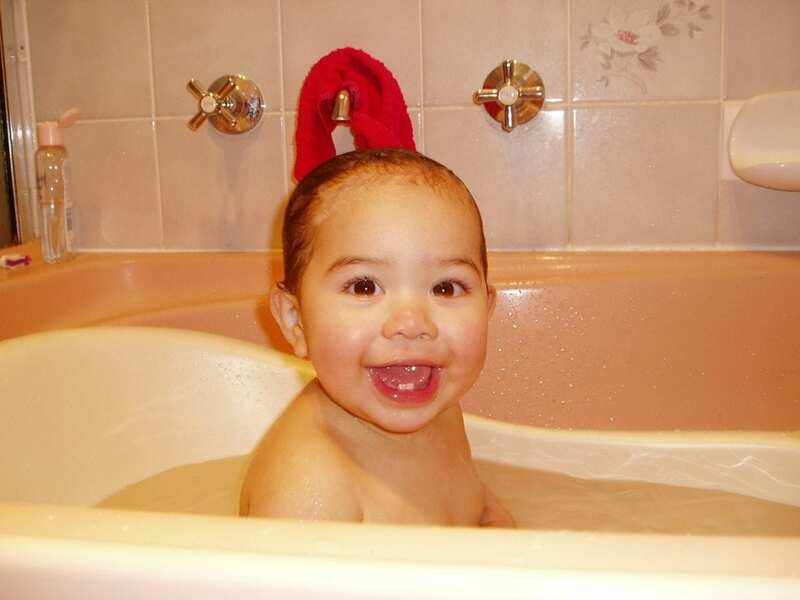 Often seen as a necessary part of the bedtime process, bath time also gives you a chance to bond with your little one. Making it more of a fun activity isn’t just good for your baby, it benefits you too. So how exactly can you make bath time a fun, enjoyable experience? Below you’ll discover 5 top tips to make bath time more enjoyable. What better way to have fun than to sing your favorite songs? Ok, so they’re not going to be able to join in, but they’ll definitely appreciate hearing you give it your all. You don’t have to be an awesome singer; in fact, you don’t even have to sound on-key! Your baby loves to hear your voice. They find it relaxing and soothing and it’s even educational. Did you know your little one learns more about rhyme and language skills when you sing to them? So turn bath time into karaoke sessions and you’ll not only have fun, you’ll be helping with baby’s development. Water toys are fantastic for bath time. It may seem counterproductive when you’re trying to get baby to relax before bed, but a little play time could actually encourage a better night’s sleep. Combined with the soothing feel of the water, after a short burst of play your baby is likely to be extra-sleepy afterwards. Of course, this isn’t guaranteed! But many parents find it does help. Be sure that any toys you do use in the bath are specifically designed for that purpose. Never use electrical toys in water and focus on plastic toys as these will dry out quickly when bath time has finished. 3. Let There Be Bubbles! Who doesn’t love bubbles? Add plenty of baby friendly bubble bath and watch their face light up. They’ll love splashing their little arms in the water. Likewise, they’ll really enjoy just watching the bubbles floating across the bath. There’s the added benefit if you use baby bubble bath, of a calm, relaxing scent. So if you are worried about getting them over-excited before bed time, this is a great soothing idea. Of course, you need to be careful not to overdo it, and pay close attention to the bubble bath solution you use to ensure it is safe. Bubbles can increase the chance of UTIs, which is why certain solutions are not recommended for children under 3. Waterproof baby books are great for distracting baby and turning bath time into a more enjoyable experience. They may not be able to read yet, but they’ll love hearing the sound of your voice as you read the books aloud. You can even add extra enjoyment by reading in different tones of voice for each character. Your little one will be mesmerized. They’ll also love the pictures in the books too. Bath crayons can be a great, fun activity. They turn the water different colors and can safely be used on the bath, tiles and even on babies themselves. They wash off easily and allow your little one to be as messy as they like, while also amazingly getting clean at the same time. Just be sure to keep an eye on them as they may attempt to put the crayons in their mouth! Bath crayons are largely best suited to older babies. 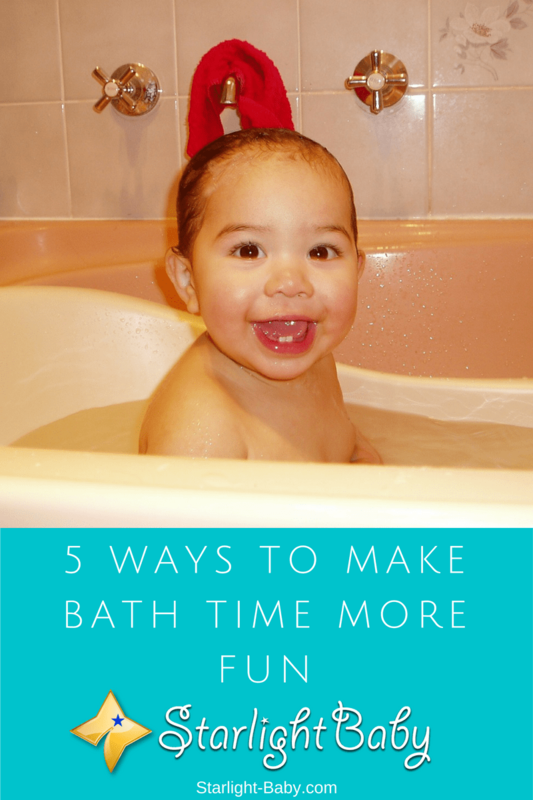 The 5 tips above are tried and tested methods which many parents use to make bath times more fun for their babies. If your little one starts to identify bath times with fun and enjoyment, they’re going to actually look forward to them. As always, safety is paramount. Make sure the water is warm, not hot or cold, and try and keep the room warmer too. This is because babies tend to lose their body heat pretty quickly. Turning the heating on around ten minutes prior to bath time will ensure baby stays nice and cozy. Overall it’s easy to make bath times more fun for babies and toddlers. If you’re struggling to get your little one to enjoy the bathing experience, try one of the 5 tips above today. And hey, if you have your own, we’d love to hear that as well! Baby Talk – Does Your Tone of Voice Determine Baby’s Development? Great tips. I use them all the time and they always do the trick – they make the bath time ten times more fun. My baby would confirm it himself if he could, haha. His favorite are bubbles. The more the better. We found this really good children’s shampoo specifically for bathing them and it is incredible. It creates so many bubbles and a bit of foam. He has the time of his life splashing around trying to catch the bubbles. He also absolutely adores using this big weirdly shaped foamed creature – it is sort of like a sponge. Then it stays afloat in the water. He always loves playing with it. He would stay in the bath for hours if he could. I personally really enjoy whenever its bath time. At first, it took me a while to just let go and stop worrying but now that has become a routine, it is amazing fun. And ofcourse the shampoo or soap should be such that the eyes can put up with it. The no more tears soap perhaps would be ideal. Adding toys, bubbles make the kids happy in a bath time. I like to watch a baby taking a bath, its smile, joy, and happiness it makes me feel so wonderful, I know that I did something good in this life!